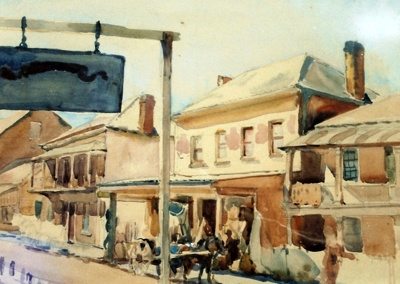 George Street is the oldest street in Windsor and was already in use as the main thoroughfare through the settlement when Governor Macquarie named it (and Windsor) in 1811. In the 1920s, when the Clints lived in Windsor, it was the main commercial centre of the town with the Post Office, banks, hotels and the major shops strung out along its length, interspersed with private houses. This picture shows the eastern side of the street from the corner with Johnston Street, going south towards the present day Deerubbin Centre. The largest of the three buildings is probably O’Brien's Produce Store which had opened in 1898. It burned down in about 1930. Alfred Thomas Clint (1879-1936), landscape painter and scenic artist, belonged to the fourth generation of Clint artists, being the fourth child and eldest son of Alfred Clint Junior and the brother of George E. and Sydney R. Clint. He was born in Sydney and received his first artistic training from his father, later studying at the Sydney-based Julian Ashton Art School. He worked as a scenic artist in the business established by his father, designing and creating theatrical scenery, Christmas displays for large department stores, and parade floats for various institutions, and continuing the business after his father's death in 1923 in partnership with his brothers. He and his brothers also figured in the Sydney Fine Arts scene. He became a member of the Society of Artists and exhibited regularly at the Society's shows from 1910 to 1935, and also had works displayed in, among others, the Australian Fine Art Galleries, the David Jones Gallery and the Blaxland Gallery . In 1917 he married Gwendoline Drape (1898-1978) and had three children. For most of his life he lived in Sydney, but for a time in the 1920s lived in the Hawkesbury region with his father (who died in 1923) and his brothers. After his death his only son Julian Clint undertook the task of collecting and preserving the remaining unsold works of this generation of Clints.